Saint Cyril, Bishop of Turov, was born of rich parents in the thirties of the twelfth century in the city of Turov at the River Pripyat. From his early years Saint Cyril eagerly read the sacred books and attained a profound understanding of them. He studied not only in Russian, but also in Greek. When he reached maturity Saint Cyril refused his inheritance and was tonsured in Turov’s Saint Boris and Gleb monastery. He struggled much in fasting and prayer and taught the monks to obey the igumen. A monk who is not obedient to the igumen does not fulfill his vow, and therefore is not able to be saved. Three writings of Saint Cyril on monastic life have survived, one of which, “A Narrative on the Black Clergy from the Old Law and from the New,” may be ascribed to a period of his being in the monastery. After a certain while Saint Cyril lived on a pillar, where he increased his asceticism, and meditated on the Holy Scripture. Many turned to him for counsel in the spiritual life. 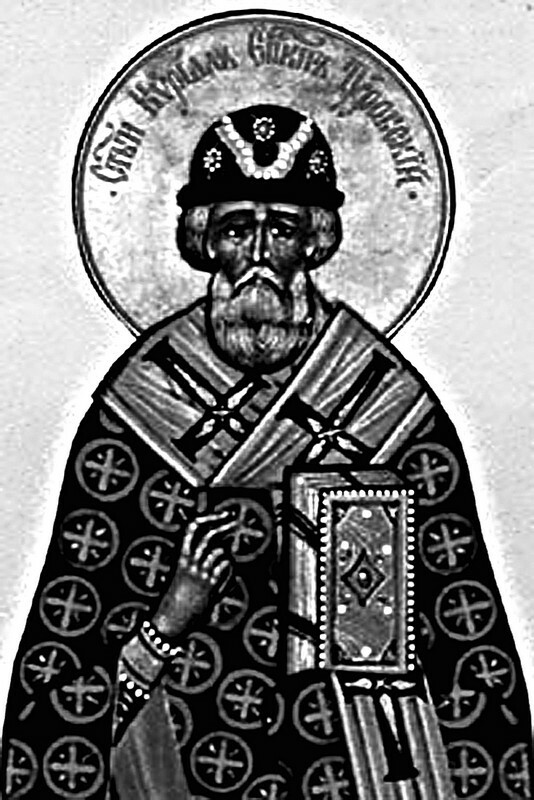 Saint Cyril’s holiness of life and profound enlightenment became known to many, and so he was chosen as Bishop of Turov. In 1169 Saint Cyril took part in a council censuring Bishop Theodore, who occupied the Vladimir-Suzdal cathedra and who sought to separate from the metropolitanate of Kiev. Saint Cyril denounced the heresy of Theodore and wrote many letters to the holy prince Andrew Bogoliubsky (July 4), in which he provided him instruction and guidance in discovering the cause of church disorders in the Rostov region. Because of his love for solitude, Saint Cyril left his See (by the year 1182, Bishop Laurence is mentioned as the Bishop of Turov) and he devoted himself fully to spiritual writing. He composed a discourse on the yearly cycle of the Lord’s Feasts, but not all of them have been preserved. The works of Saint Cyril deserve a place beside the works of the holy Fathers in book collections. As a theologian Saint Cyril believed his task was to discern the true and hidden meaning of various texts of Holy Scripture.